West Bromwich Albion have had a total of 35 managers dating from 1890 to the present day, and as expected, each with their own varying degrees of success. Here you will find a comprehensive timeline of each and every one of West Brom's gaffers from Louis Ford to current boss Roberto Di Matteo. Ford began his associated with West Bromwich Albion Football Club in 1887, when he joined the club as honorary financial secretary until 1890. On 5th June 1890 he became the clubs first official paid manager, receiving an annual salary of £50. During his first season in charge Albion finished 12th of a 12 team division, a position they also kept the following season - although the division had expanded to 14 clubs by that point. Ford served as an FA Councillor from 1890-93, and from 1894-97 he was the vice-president of the Football League. Henry Jackson (1892-94): Jackson was a member of West Brom's first board of directors. He managed Albion for 18 months, during which they finished 8th of 16 teams. Edward Stephenson (1894-95): Stephenson was dismissed from his job as manager of the Baggies after just 8 weeks, during which the Albion suffered 9 defeats, winning 5 and drawing 1. Despite his early dismissal, West Bromwich born Stephenson remained a keen supporter of the club and a shareholder. Clement Keys (1895-96): Took over the role of manager from Stephenson until the end of the season. Frank Heaven (1896-1902): On 25th August 1896 Frank Heaven took the role of manager for the Albion. He oversaw one of the most important moments in West Brom's history - their move to current ground 'The Hawthrons'. Heaven was asked to leave the club in 1902 after a disagreement with the board of directors. He died tragically on Boxing Day in 1905 aged just 32. Fred Everis (1902-1948): One of Albion's most successful all time managers, and still officially the longest serving manager in the English Football League with 46 years service. Everis had been a member of staff for Albion since 1896, and assumed the role of manager in 1902. During his time in charge of the Baggies they played 1750 competitive games, including those through both world wars. Everis won the FA Cup and promotion from the 2nd division in 1931, as well as a second division championship in 1911 and first division championship in 1920. Apart from the 1931 FA Cup victory he also led Albion to two other FA Cup finals in 1912 and 1935. Jack Smith (1948-52): Played 177. Won 70, drew 45, lost 65. Jessie Carver (1952-53): Played 19. Won 10, drew 4, lost 5. Vic Buckingham (1953-59): Played 306. Won 135, drew 65, lost 96. Gordon Clark (1959-61): Played 100. Won 42, drew 19, lost 39. Archie Macaulay (1961-63): Played 65. Won 27, drew 16, lost 22. Jimmy Hagan (1963-67): Hagan began his managerial career at the Hawthorns on 10th April 1963, returning to the club who turned him down at a trial in 1933 - after which he went on to play for numerous clubs, including Sheffield United for who he made 364 appearances netting 118 goals. Hagan led the Baggies to League Cup success in 1966 beating West Ham 5-3, but they failed to retain the cup the following year, being beat by third division opposition QPR 3-2, despite having a 2-0 lead at half time. That, along with poor league performance cost Hagan his job at the Albion. But Hagan is perhaps best remembered for his £25,000 signing Jeff Astle from Notts County. Alan Ashman (1967-71): Ashman led Albion to FA Cup glory in 1968 and also to the final of the League Cup in 1970. During his reign he signed the clubs first £100,000 player; Colin Suggett. Played 229. Won 79, drew 71, lost 79. Don Howe (1971-75): Played 196. Won 62, drew 55, lost 77. Ron Wylie (1982-84): Played 80. Won 30, drew 16, lost 34. Nobby Styles (1985-86): Played 23. Won 4, drew 8, lost 11. Ron Saunders (1986-87): Played 67. Won 14, drew 19, lost 34. Brian Talbot (1988-91): Played 121. Won 39, drew 38, lost 44. Bobby Gould (1991-92): Played 69. Won 24, drew 23, lost 22. Ossie Ardiles (1992-93): Played 59. Won 33, drew 11, lost 15. Keith Burkinshaw (1993-94): Played 71. Won 17, drew 19, lost 35. Ray Harford (1997): Played 44. Won 20, drew 7, lost 17. Brian Little (2000): Played 42. Won 9, drew 18, lost 15. Gary Megson (2000-2005): Played 222. Won 96, drew 70, lost 66. Megson took over as manager in 2000 when Albion were in real danager of being relegated to Division 2. After avoiding the drop the following season Megson guided the Baggies to the Division One playoffs - where they lost out to Bolton Wanderers at the semi final stage. The following season Albion won promotion to the Premier League, finishing second in the table after overcoming an 11 point gap between themselves and local rivals Wolverhampton Wanderers. Megson won the Nationwide Division One manager of the year award for his efforts - but was to fall out with club Chairman Paul Thompson the following season after saying the club were ill prepared for Premiership life. Thompson resigned after a very public showdown with fans favourite Megson. After an inevitable relegation Megson took the Baggies straight back to the Premiership, but after a fall out with new Chairman Jeremy Peace and a bad start to the season, he parted company with the club. Bryan Robson (2005-2006): Played 82. Won 20, drew 24, lost 38. Tony Mowbray (2006-2009): Played 140. Won 57, drew 32, lost 51. Tony Mowbray's first season in charge of the Albion ended in playoff misery as they lost the final at the new Wembley to Derby County 1-0. But Mowbray was to take the Baggies from strength to strength during the 2007/08 season, guiding his side to their second visit to the new Wembley in the FA Cup semi-finals, where they were defeated 1-0 by Portsmouth. Albion were once again promoted to the Premier League as Championship champions, but were to be relegated after just one season in the top flight. In the summer of 2009 Mowbray left Albion to become manager at Celtic. 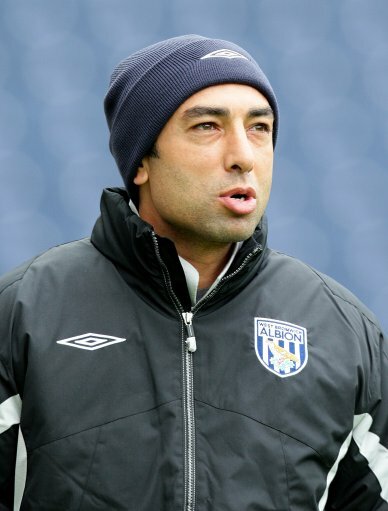 Roberto Di Matteo (2009-present): In his first season in charge (2009/10) Di Matteo achieved automatic promotion to the Premiership. The Baggies sealed the promotion with a 3-2 victory away to Doncaster Rovers on 10/4/10. Just a little sample of what I've been working on for our new 'History' section. Is Steve Clarke the right choice of manager for West Brom, or should the club have aimed for a higher profile manager based on finishing 10th last season?